The American basswood (from now on I'll just call it the basswood, since I'm in one of the Americas) is a great native species that's tolerant of many environmental conditions naturally thrown at it in North America (from Ontario and Quebec all the way south to Nebraska and Tennessee, but some pocket populations even exist in Mexico!). It is highly drought-tolerant, is shade-tolerant, salt-tolerant, and even flood-tolerant. 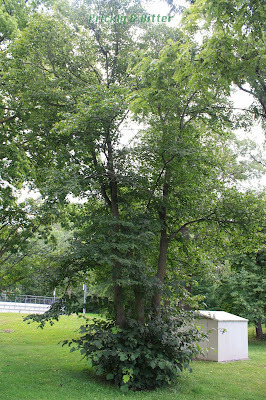 Unfortunately, this tree has largely been replaced in ornamental plantings by the littleleaf linden (or, if you'd like, the European basswood), Tilia cordata, because of the rather unruly growth of the basswood (you can read all about the littleleaf linden HERE). 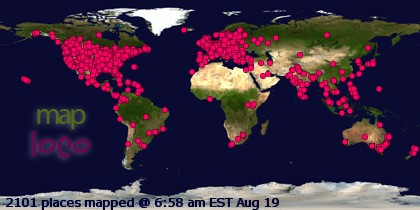 What do I mean by unruly growth? Well, if you look at the first image that's not exactly the type of "specimen tree" you'd normally see on boulevards. Once this tree reaches a certain height, it's nearly impossible to stop it from starting its bushy growth. It naturally clones from the base of the tree, and suckers form at the base. If you catch them early they're easily removed with a pair of small hedge clippers. But because of their vigorous growth they can get very large very quickly. They can grow so fast, in fact, that it's sometimes difficult to determine which was the original stem and which are the suckers! There are a few varieties of the basswood that don't sucker, but early settlers in North America figured this tree was incredibly similar to the "lime tree" they grew back home, so they just brought their linden trees to North America. 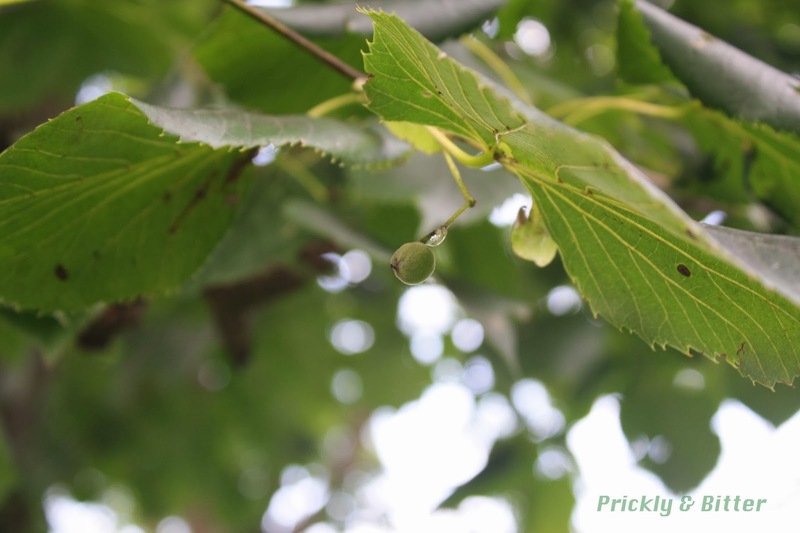 Now, you can find large linden trees planted along roadsides as ornamental trees. 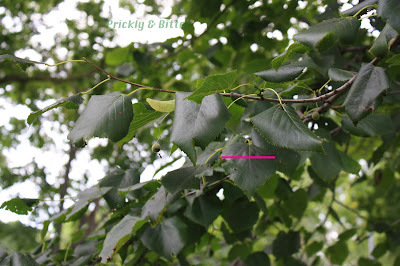 If you look at the second and fourth photos, you can see a rather unique characteristic of the basswood that the littleleaf linden doesn't show, and that's that not all leaves are created equal. Since I didn't think to include an object for reference of scale (only realizing after the fact that this was a poor decision), I included scale bars for reference to measure the widths of the leaves. The second image above is of a canopy leaf, as evidenced by the fruit that can be seen growing (they do not grow on sucker shoots until they reach the canopy). 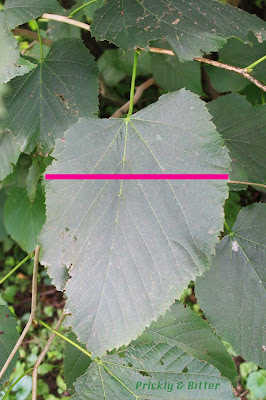 The scale bar on that leaf corresponds to about 10 centimetres, or about 4 inches. That's a pretty average size for a leaf in the canopy, but the ones at the very top are slightly smaller (some in shaded areas near the trunk of the tree an also be slightly larger). The fourth picture is a leaf growing on a sucker, and the scale bar on that leaf is about 35 centimetres, or almost 14 inches. That's an absolutely enormous difference, and one that can be consistently seen in all basswood trees (so you don't have to worry that I chose a mutant tree!). So why the huge difference in leaf sizes? This phenomenon can actually be seen in many plants, but to a smaller extent: leaves changing sizes or shapes to be better competitors for light. The small leaves at the very top of the tree don't have to be very big to get lots of sunlight, because nothing is blocking them. In fact, many leaves at the tops of tree canopies are angled so only the edges are exposed directly to this sun which prevents them from getting sunburnt :) (this phenomenon is called "scorch" in plants and is common in plants grown outside of their native range) As you travel further down the trunk towards the ground, there is less and less sun that reaches the lower leaves. They must grow bigger, and are usually darker in colour, to be able to absorb more sunlight to make sugars. For something without a brain, basswoods are pretty smart! Surprisingly enough, both the leaves and the fruits of this tree are edible to humans, although not all that pleasant. I can't say I've ever tried them, and I also can't say I'll be tempted to do so in the near future. That being said, if you get lost in a maple-beech hardwood forest and are looking for food, finding a basswood would be a nice source of vegetal munchies to sustain you for a few hours. The basswood has also been used as a medicinal plant for many centuries, having effects very similar to the littleleaf linden (which is arguably more potent). The leaves can be steeped in a tea and consumed as a treatment for cough, cold, flu, and indigestion (none of which have been demonstrated to be effective treatments according to modern scientific studies); the flowers can also be steeped for the same purposes but also as a diuretic to promote urine production, as a sedative, and as an antispasmodic to quell intestinal cramps; and even the wood is used (once burned to charcoal) as a treatment for lower leg ulcers, cellulitis, edema, or infection (again, none of these treatments have shown any promise in modern clinical trials). As an aside, rubbing burnt wood into an open wound in order to treat infection is probably not a smart idea. Wood is festering with microbes whether burnt or unburnt (it's amazing the types of bacteria and fungi that can grow on charcoal! ), and in order to sterilize it you have to use it while it's hot; rubbing burning wood into an open wound will probably do more harm than good, and I'm sure you can imagine why!